I am an amateur photographer based in somerset. My focus is mainly landscapes and astrophotography. When I was first asked about doing an article for end frame, my first question was if it has to be a landscape image. To my delight the answer was no and was given several examples. 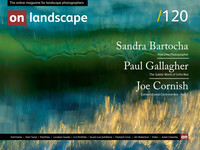 I probably wouldn’t have managed to pick one landscape image to talk about. There are so many great photographers out there (both amateur and professional) with so many great images. Plus, as landscape photographers we deal with landscape images everyday, so I thought something different would be interesting for everyone! I guess one could argue my selected image is a landscape as well – just on a grander scale. This is an image of Rho Ophiuchi Nebuale in Scorpio constellation by Scott Rosen in California. There are several reasons why I chose this image over many others. First of all it is taken with a DSLR instead of a temperature controlled CCD camera (sure it is modified to detect a wider spectrum of light but I guess it’s no different than an IR camera and IR photography). It is also taken with a 200mm lens instead of a telescope. So these two factors put it more into the realms of “regular” photography as I like to call it. It is much more accessible for photographing (unlike the famous eagle nebula for example where you need 1000mm or even longer to capture the details). It is also one of the finest examples I have seen. Astrophotography is full of images that look good in small size but looks full of noise & artefacts when you zoom in. This particular image has a great 3D effect such that the nebula pops out against the background of stars when you view it full size. It is also processed perfectly; it is full of details in the delicate nebulae yet it is not overcooked (which is so easy to do when you are trying to extract as much detail as possible). And finally it looks really pretty – it has a nice mix of different nebulae with different colours and complexity… and to think the space is full of objects like this!